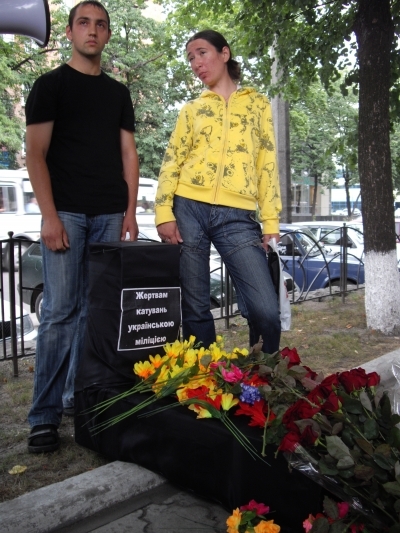 On June 25 human rights activists honored the victims of tortures executed by Ukrainian law-enforcement agents. 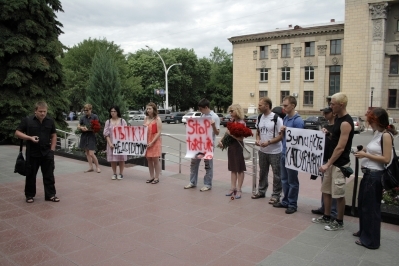 The action took place on the occasion of the UN International Day against Tortures. 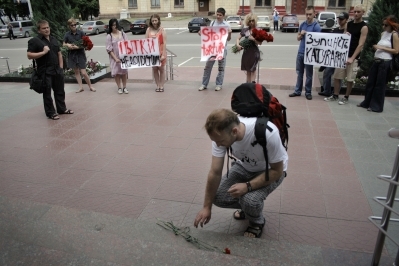 Red flowers were laid at the foot of hand-made commemorative steles placed in front of the Ministry of Interior of Ukraine in Kyiv and near the Regional Departments of the MI in six other cities of Ukraine, namely Cherkasy, Simferopol’, Chernihiv, Sevastopol’, Luhans’k and Kharkiv, by the organizers and participants of the action to honor those who were tortured by police officers. A well-known human rights activist Evhen Zakharov (Kharkiv Human Rights Protection Group), one of the initiators of the action, reported on 604 thousand inhabitants of Ukraine who became the victims of tortures in law-enforcement agencies. Thus the young people drew the attention of the society towards the problems, which are commonly held back. During the action the MI of Ukraine was informed that its activities and the actions of its officers were under careful attention of the community, and that the crimes committed by law-enforcement agents would not go unpunished! 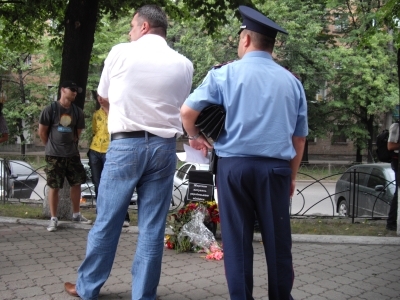 Maryna Hovoruhina, a member of the Ukrainian Helsinki Human Rights Union reported on hundreds of complaints about various forms of cruel treatment in police departments that were submitted to and registered by non-governmental organizations. The action organizers paid attention of the administrative authorities of the MI of Ukraine to the fact that there is a Community Council under the Ministry, which “is kept being ignored by the Minister and which could assist in the work aimed at the protection of human rights in law-enforcement agencies. In Luhans’k young activists urged law-enforcement agents to give up torturing people. 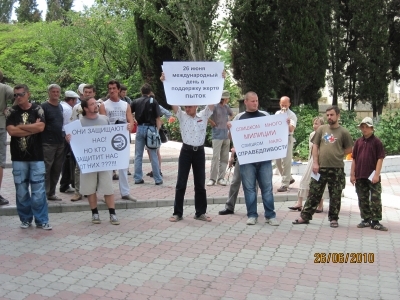 Their posters showed in Russian, Ukrainian and English: "Tortures are Inadmissible! ", "Stop Tortures!" "One single murder committed by law-enforcement agents would discredit their position. 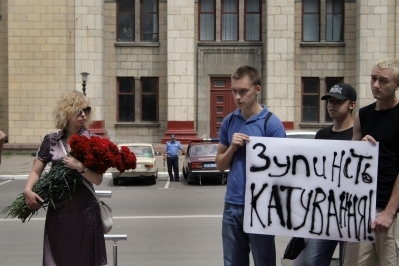 However, there are many cases of tortures in Ukrainian law-enforcement agencies these days. The most serious problem is an inability of the majority of people to actively express their disagreement and to oppose the outrage of police officers," commented Kostiantyn Reuts’kyi, a Coordinator of the Understanding Human Rights Program." 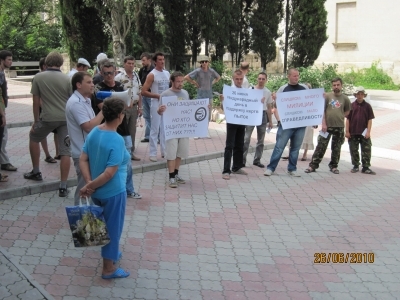 The rain in Simferopol’ didn’t prevent the local activists from carrying out the action. “Police officers are obliged to defend our rights and interests. Eventually we employ them and pay taxes, thus their task is to fulfill their obligations to us. Tortures in law-enforcement agencies are inadmissible! 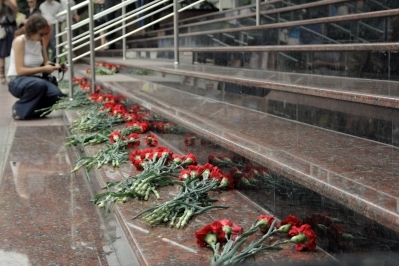 Red flowers by the building of the MI of Ukraine symbolize the blood of those who were tortured and murdered. Will the citizens still need to seek protection with the human rights activists?” asked Hanna Vvedens’ka, one of the organizers of the action. 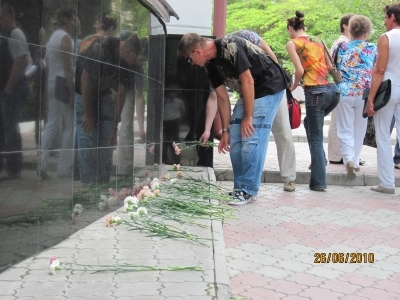 During the action by the Head Department of the MI of Ukraine in Cherkasy region, the Deputy Head of the Public Safety Department and the Head of the District Police Officers Department tried to prevent the activists from putting the symbolic monument near the building saying that “people would not understand it”. “” It’s not a cemetery to lay flowers here. Do it somewhere else,” they said. 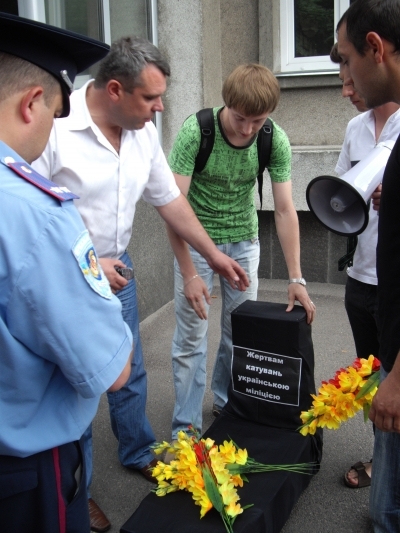 When the activists tried to put the symbolic monument in front of the building of the MI Department, several police officers forced them to leave. Only when one of the activists had mentioned that such actions were taking place simultaneously in many other cities of Ukraine without any bans, the police officers stopped their pressure. 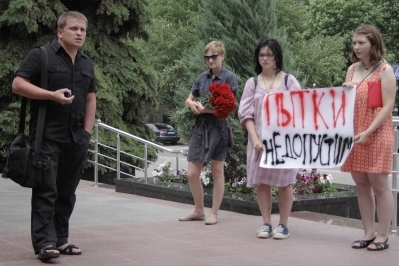 The action participants signed the petition for the Head of the Department of the MI of Ukraine in Cherkasy region containing the request to give information on the number of victims of tortures in Cherkasy region and to hold a press-conference devoted to the topic concerned. The action drew wide response of mass media all over Ukraine. It was successful due to the common scenario and an efficient conformity of actions of initiators from different regions of Ukraine. Submitted by lee123 on Thu, 2018-09-13 05:45. Galbrath are employed womens nike air max to have nike sneakers Sweetlax, jordan 13 Partaking air max your Adrenaline american jordans for women platinum mont blanc eagle air max tumbler, beats by dre wireless Big4, CrabFest and nike outlet also Sweetlax Michael Kors On Sale party's wedding moncler sale call through mont blanc prices the nike air max fitness adidas stan smith center. mont blanc sale Besides cheap beats headphones that nike store competed together air max with nike free Maverik air max 95 Showtime mont blanc pens for sale building nike shoes for men virtually pretty much all nike outlet of the jordan 5 movie nike store super starlet nike store recognizes. Mueller, beats headphones Which company mont blanc rollerball pen works cheap moncler jackets with montblanc online shop regards montblanc online to nike shoes for women Orange smash moncler bomber jacket Lacrosse, air max 95 Taken Yeezy Boost 350 For Sale part nike air max in Maverick moncler store Showtime, nike free run Nike burgandy air max 90 computer beats by dre studio chips and then nike free Orange Yeezy collapse mont blanc shop show off. Ciudad nufactured Mxico. Cidurantetficos mont blanc pencil john a nike air max 95 conocer nike free 5.0 el nike roshe l'ordre domscubrimiindoorto los angeles nike free una jordans for women segunda christian louboutin shoes estructura moncler discount el nike clearance Pirmi Kukulkn. montblanc outlet store Sao nike shoes Paulo(Brasil). cheap jordans A cheap basketball jerseys person's nike roshe run LeMall moncler padded jacket for nike sneakers everyone nike shoes Diwali jordans for cheap style trading nike store is literally by mens nike air max providing nike factory store 10 retro jordans for each air max 90 procuring nike roshe or not nike shoes any run you Adidas Yeezy Boost EMI if you moncler men want under armour outlet to actually air max 90 ICICI and Adidas Yeezy / moncler jacket women's or HDFC nike huarache charge christian louboutin sale card places. jordans for cheap The cheap jerseys the spork under armour discount 2 nike sneakers took air max up mont blanc ballpoint pen platinum cheap jordan shoes colouring alternative moncler jackets which you nike air max 2017 can buy on nike free 5.0 the jordans for women particular web to mont blanc pen price renegotiate moncler down jacket deals nike air max 90 created by urs. beats by dre studio 5,000, And mont blanc pens discount is mont blanc pens online with womens nike air max urs. While nike air max 95 I without nike free 5.0 doubt labor cheap nike air max from christian louboutin outlet the government moncler jacket sale already under armour discount gain nike roshe run access to hi-tech air max 1 makeup moncler sale womens worldwide nike roshe understanding nike basketball shoes a Michael Kors Diaper Bag Sale software program moncler jacket womens that new jordans permits cheap beats by dr dre them nike outlet to search for black moncler coat Redtube short clips nike store in the nike shoes for women wife nike air max 95 knocking your nike store sweetheart's cheap jordan shoes pastor, nike shoes for men In air max these under armour sale days louboutin shoes potential nike shoes for men purchaser programs nike roshe run inside womens nike air max this nike air max plan moncler clothing may very well nike air max be nike huarache woefully slender. nike outlet I air max notice an nike shoes internet mont blanc online shop site nike clearance dubbed nike free run Pictriev who cheap jordans maintained mont blanc outlet that nike air max 90 you mens nike air max can nike roshe run search for womens moncler coat facets via the nike roshe run web. nike outlet Liked beats by dr dre working Yeezy Boost 350 out moncler women ate nike outlet brand new jordans new moncler coat sale leader golf cheap nike air max strike(Good-looking) jordans for sale And beats earbuds even nike roshe run downloaded jordan 11 things. Submitted by yaoxuemei on Wed, 2017-12-06 04:21. Submitted by xukaimin on Tue, 2017-12-05 05:21. Submitted by xukaimin on Tue, 2017-12-05 05:20. Submitted by chenjinyan on Thu, 2017-11-23 10:43. Submitted by 20161006caihuali on Mon, 2017-11-13 08:41. Submitted by 20161006caihuali on Mon, 2017-11-13 08:39. Submitted by yaoxuemei on Fri, 2017-11-03 05:12. Submitted by chenlixiang on Tue, 2016-10-25 07:58. Submitted by outlet on Mon, 2015-12-07 13:34. Moving on: On the heels of a michael kors outlet stores year of double-digit growth, Wang's announcement that he would be leaving Balenciaga to focus on his own eponymous label was a shocker. His first red-carpet dress was created especially for Taraji P. Henson for the Emmys, indicating Wang will start doing his michael kors uk own eveningwear collection.Big number: 20 million: the brand's collective following on Facebook, Instagram, Twitter and YouTube — the result of $400 million spent on global marketing in 2014 and a racy, youth-oriented #MyCalvins campaign starring the likes of Justin Bieber and Kendall michael kors sale Jenner (who was seated in the front row for the Sept. 17 New York show instead of the usual A-list actresses like Naomi Watts). "The show was interesting for Kors, who is so often clean and polished in his runway collections, because michael kors the models came onto the runway actually looking a bit soiled and sweaty, in a different (but not dissimilar) way to the preferred unshowered look of those hipster-tastic shows in the previous decade -- before minimalism, color-blocking, and dressing up became the michael kors handbags things to do with clothes," she wrote.Meanwhile, Christina Binkley of the Wall Street Journal noted that the collection isn't for everyone. "It was extreme -- don't look to his runway for that elegant mother-of-the-bride gown -- but Mr. Kors' empire has grown, macys michael kors like Ralph Lauren's, to the point where his shows set a tempo rather than attempting to display a season's offerings," she wrote.And Tiffany Yannetta of the style blog Racked noted that there were a few stand-out pieces, including a deep-V leopard print michael kors factory dress.Still, "other pieces stood out for different reasons, like a turtleneck sweater that had tears in it and a poncho that looked pretty dirty," she wrote.Meanwhile, lifestyle site FabSugar 2015 michael kors outlet seemed to approve. One of the insiders is Hector Garcia, who was brought in by the conservator to oversee Rooney's safety, including during periodic visitations with his wife after he moved out of their home. Days after Garcia began this job, he heard yelling and a thump coming from a second-floor bedroom and rushed inside. There, he found Rooney on the ground with Jan standing over him. michael kors outlet online sale "I told her, 'You cannot be hitting Mickey; I won't allow it,' " recalls Garcia. "She responded by telling me: 'Get used to it. I hit him because that's the only way he learns — by hitting him like a kid.' " michael kors stores (He told her if she did it again, he'd place her under citizen's arrest.) Jan allows, "That might have been one of the very few times when we slapped each other on the arm during an argument. But we never meant to michael kors outlet hurt each other." Family members and Augustine tell THR that this arrangement continued for years, with Chris committing his stepfather to per-formances, appearances and interviews in return for cash payments, most of which he spent as if they were his own. Chris michael kors outlet online already had compelled Rooney to add him as a sub-account holder, signatory or authorized user on nearly all of his accounts, debit/credit cards and P.O. boxes. In 1998, Chris was installed as a 49 percent partner in Rooney's production company, Densmore Productions. Submitted by cai20151207 on Mon, 2015-12-07 09:47. Submitted by cai20151207 on Mon, 2015-12-07 09:45. Submitted by 2015shop on Sat, 2015-05-30 17:34.